Very recently i encountered with a small child, in Hyderabad, aged 11 years, carrying some food items by her both hands. I enquired with her mother, she told me the whole story. The food items which was not fit for the actual owner was given to that maidservant. It really shocked me to realise that we and our society is ignoring those people without them we can not survive a single day - be it a safaiwala or be it a maidservant or be it a washer-man. These are the people who are working hard to make our world a better place to live. And we so-called educated people working hardly to make their life better. Then i decided to make them realise that they are part of our family/society/world and to celebrate this Diwali with their children. 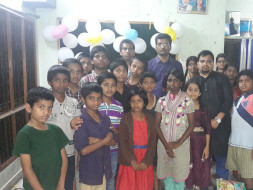 In mid September, 2016 i visited an orphanage called Vatsalyam in Hyderabad. I was shocked to see the talent and energy those little kids have. At the same time i am feeling very sad because they don't have their parents. What can be done for them. I decided to go to the same way as above. Then i start discussing this idea with so may people. They appreciated the idea. I got motivated and create a page on facebook - YE DIWALI DIL SE - WITH 100 CHILDREN. The bottom line is i want to include so many people in this initiative so that they can also get motivated and do some charity and contribute to make this world a better place for everybody.